Where a number of transmitters or receivers are to be connected to a single antenna, this unit is externally rated and can be mounted alongside the antenna. 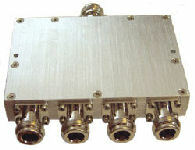 It has connection for the antenna and up to four transmitters / receivers. Note that there is a certain amount of signal loss associated with this unit, so transmitting ranges should be reduced accordingly - by a factor of about one-third. If this loss in unacceptable, a separate antenna must be used with each transmitter / receiver.